There have been numerous experiences encountered by disciples of Shri Shraddhanathji Maharaj. Please click on the link to read experiences of seven such disciples. In India saints have a special place in the society and the saints have always guided the mankind on the righteous path. Although the saints have made very important contributions to the development of mankind, but nowadays it is difficult to find real saints. In fact finding a saint like Shri Babaji Maharaj is very difficult. One continues to hear so many stories about saints and occasionally one can read about them in the newspapers. Yet there is a section of society which has no interest in saints. Likewise, I also had no special interest in saints. My father had similar thoughts about the saints although he might occasionally mention a word or two about saints. However, my mother had immense respect for saints. She used to regularly visit Shri Babaji Maharaj and also visited regularly Shri Amritnathji Maharaj’s Samadhi in Fathepur. My grandparents (from my mother’s side) are from Laxmangarh. Once when my father was visiting Laxmangarh he had the good fortune of visiting Shri Babaji Maharaj. On returning to Delhi, my father spoke very highly of Shri Babaji Maharaj. 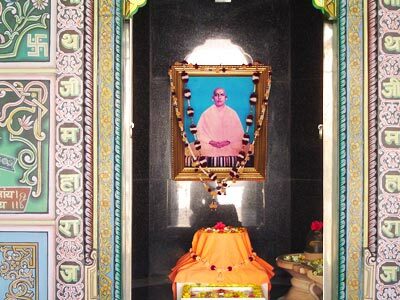 On hearing my father, I also felt a desire to see Shri Babaji Maharaj and next time when I visited Laxmangarh I went to the ashram to see Shri Babaji Maharaj. Shri Babaji Maharaj was sitting on his cot (a hard bed takhat) and a number of devotees were sitting in front of him on the ground. I entered the room and greeted Shri Babaji Maharaj with folded hands. Before I could sit down, Shri Babaji Maharaj asked my name. I told my name and then he asked where I was from. I said I was from Delhi. Then he asked “who (which family) do I belong to?” I said “I am son of Panna Lalji and my mother’s name is Mani who is from Laxmangarh”. I said my grandparents live in Laxmangarh. To this Shri Babaji Maharaj said “so you are son of Mani! How are you? How is Mani?” I said “all are fine Maharaj”. I would have sat for only 10-15 minutes when I felt like leaving. Shri Babaji Maharaj, on his own said “you may wish to take some prasad (offering)”. And he gave me a fistful of batasha (sweets) and I left the ashram. This was my first meeting with Shri Babaji Maharaj. Although I sat for only few minutes and apart from giving my introduction I didn’t say anything, I felt very good and I decided that whenever I would come to Laxmangarh I would surely visit the ashram to see Shri Babaji Maharaj. From then onwards whenever I visited Laxmangarh, I would visit the ashram and Shri Babaji Maharaj would ask about the well being of my parents. This continued for many years; Shri Babaji Maharaj never asked for my introduction again and I felt that he has a very sharp memory and he remembers everything. Nowadays, after hearing experiences of other devotees, I realise that Shri Babaji Maharaj was a true brahmgyani (realised soul). He was the knower of past, present and future. He knew about everyone and everything and although nothing was hidden from him, he always behaved like a normal person. In 1980 my uncle passed away and I had to go to Laxmangarh. In the evening, after dinner on my way to station to go to Sikar, I decided to visit the ashram. Shri Babaji Maharaj was sitting outside in the garden on a cot and the devotees were sitting around him on the grass. I greeted Shri Babaji Maharaj and raised my palm for the prasad (offering), to which Shri Babaji Maharaj said “sit down”. I said that I had a train to catch to which Shri Babaji Maharaj replied “sit down; there is enough time to catch your train”. As soon as I sat down he asked me to take my dinner (Prasad) to which I replied that I had dinner at home. After sometime Shri Babaji Maharaj again asked me to have my dinner and I again refused saying that I was not hungry. In the meanwhile Abhayanathji Babaji, who had not taken the monk hood that time, came and stood next to Shri Babaji Maharaj. For the third time, Shri Babaji Maharaj asked Abhayanathji to serve me dinner and so I quietly followed Abhayanathji. Abhayanathji served me two chappatis (Indian bread), guanar ki fali (type of vegetable) and kadi (type of curry); this was a proper meal and just a while back I had my dinner. I told Abhayanathji that I won’t be able to eat this much, to which he replied “yes you would be” and walked away. Now I had no choice but to eat and I started eating. To my surprise I was able to finish off everything without having any uneasiness feeling. After my meal, I came back and sat with other devotees in front of Shri Babaji Maharaj. After a while, Shri Babaji Maharaj said “it is time for your train”. I took the prasad (offering) and reached station. When I reached platform, the train was just arriving at the platform. By this time I had not realised anything and I was lost in my thoughts with a feeling that I am doing everything. Those days my financial situation was not good. After I returned from the trip, my son completed his B.Com degree and got a job as an apprentice in a factory. After a year he was offered a permanent role although all his other colleagues were made redundant. Subsequently my financial situation also improved considerably. Still I had not understood anything. Now when Shri Babaji Maharaj has left his body, suddenly one day I realised that all this has happened after Shri Babaji Maharaj asked me to have dinner (Prasad) in the ashram. He had forced me to take Prasad (meals) so that my situation could improve. At that time he knew very well that he wouldn’t be meeting me again. After this realisation, my feelings (faith) towards Shri Babaji Maharaj have become stronger and I have started doing the prayers regularly. As my faith continued to increase, Shri Babaji Maharaj’s grace also continued to grow. My daughter didn’t have any child and Jaipur’s famous gynaecologists had said that she won’t be able to have any child. By Shri Babaji Maharaj’s grace she is now blessed with a child. Similarly my daughter-in-law had two daughters and she has also been blessed with a son. There have been so many incidents in my family, that I can’t narrate them all. In summary, wherever I see in my family I feel Shri Babaji Maharaj’s grace. Most important is that I have peace of mind and I do not feel the need for anything. By Shri Babaji Maharaj’s grace I have been living happily with my family. My only prayer to Shri Babaji Maharaj is that he should continue to shower his grace on my family and may he forgive any of our mistakes. Om Shanti (peace)! Prem (love)!! Anand (bliss)!! !